The Gondwana Link program in the Great Western Woodlands is undertaking a new project with the Ngadju rangers to monitor threatened malleefowl birds and control invasive plant species. The ‘Ngadju Malleefowl and Weeds’ project will implement the Conservation Action Plan (CAP) developed as part of a Rangelands NRM supported project with funding provided by the Australian Government’s National Landcare Programme. Gondwana Link is supporting the development and implementation of ecologically focused strategic actions across 1000kms of south western Australia, to achieve a cohesive and nationally significant conservation network. The Great Western Woodlands is an area of great biological richness that extends over 16 million hectares – more than twice the size of Tasmania. It is regarded as the largest remaining area of intact Mediterranean-climate woodland left on Earth and contains about 3000 species of flowering plants, about a fifth of all known flora in Australia. The CAP process identified a number of severe conservation threats facing the area, including altered fire regimes and invasive species. 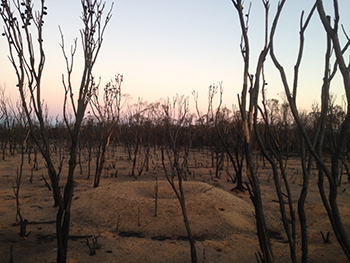 The Ngadju people are the Traditional Owners of a large section of the Great Western Woodlands and through the Ngadju Conservation Committee (NCC), Ngadju Rangers have sought increased capacity to undertake work that addresses their environmental concerns. Rangelands NRM is fostering links and partnerships between Ngadju and other regional stakeholders including local governments, mining companies, a regional biosecurity association and other industries to explore future training and employment opportunities for Ngadju rangers. Rangelands NRM Program Manager, Southern Rangelands, Kieran Massie said that there is now a core group of Ngadju Rangers trained in fire management, survey skills and methods, chemical handling and occupational health and safety. “Ngadju, working with Gondwana Link, will be monitoring and mapping malleefowl habitat as well as controlling and mapping weeds in the broader Dundas region,” he said. The Ngadju members bring important traditional knowledge and connections with the country. Ngadju participation in fighting the Dundas Bushfires of November 2015, alongside the Dundas Rural Bushfire Brigade, with training and advice from the Department of Fire and Emergency Services. 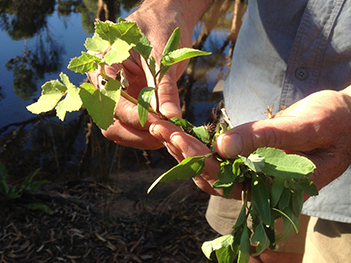 Ngadju members’ work with environmental weeds, after completing herbicide training, leading to the identification of an outbreak of Noogoora Burr south of Norseman, followed by measures to control its spread and eradicate the plants in partnership with key stakeholders. Team members also learned new skills during cactus control work on the Nullarbor under supervision of an experienced cactus control contractor, resulting in a new awareness of succulent environmental weeds. In recognition of their substantial contribution to the preservation of traditional knowledge and connection to country, the Ngadju Conservation Committee was presented with premises at Norseman District High School by Principal Bruce Nind and Manager Corporate Services Lourdes Has on 17 February 2016. Ranger Coordinator Mike Griffiths described this significant event as fundamental to the ongoing development of the Ngadju Ranger team and of practical assistance to the continued growth of the program. 2) Presentation of new premises to Ngadju Rangers in February 2016. 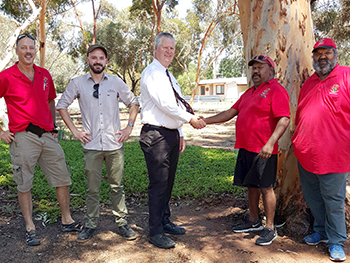 L to R: Ranger Coordinator Mike Griffiths, Rangelands NRM Program Manager, Southern Rangelands, Kieran Massie, Norseman District High School Principal Bruce Nind, Ngadju on country coordinator David Graham and Ngadju Conservation Coordinator, Les Schultz. 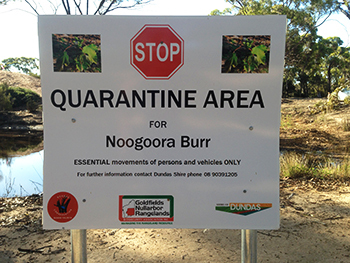 4) Quarantine sign to help prevent spread of Noogoora Burr.